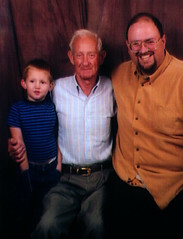 On October 2, 2010, after 87 years of a sometimes difficult and often blessed life my father passed away. During the months before his death, and after, I was in frequent contact with my mom and we were trying to figure out how I could raise the money to take a trip to New Mexico. Several times my mom encouraged me not to come yet (because I could only come once if I could raise the funds), and then my father passed. At the time of his passing, literally the weekend I learned about it, our minivan broke down on the highway. Back in 2007 and for part of both 2006 and 2008 I was unemployed and we had a zero-income family for a year and a half. It’s been two years now but our finances have been in significant deficit since that time. We have no credit, but we have much debt, and we’re trying to dig ourselves out. Without credit, we couldn’t even afford air fare on loan. With our family’s primary vehicle out of commission, we had another financial burden to try to rectify while also managing the emergency expense of a cross-country trip (even just for me). I mentioned this in passing on Facebook and to my utter amazement and humbled surpise friends and family responded. Within hours, a friend and former Christianity Today International colleague, Clay Anderson, volunteered to petition friends to raise the money. And within mere days, several hundred dollars were committed to the cause. Not only can I now afford to travel to visit Mom, by God’s grace and providence and family and friends’ generosity, we can also repair our family vehicle (that bill, alone, represented several hundred dollars since it involved replacing motor with 170K miles on it — twice). The majority of contributors to the cause were my good friends and former work-family at CTI, but friends at Zondervan, IVA Help and family also contributed signficantly. I am blessed, humbled, and honored to be surrounded by people I love who have such large and generous hearts. It is a testimony to friendship and family that they have reached deep into their pockets to help out a big lug like me in a very difficult economy when everybody is pinching their wallets. So, I’m happy to report I now have an itinerary for my trip to Albuquerque. I’ll be flying out on Thanksgiving day and returning December 1. Please pray for a safe trip and a good, emotionally restorative time with my mom. I know she’s been going through a difficult time since Dad’s passing. I hope my presence there will encourage her and give her strength, and I hope it truly helps. Though it in no way makes up for her sacrifices for me over all the years and it’s an insufficiant palliative for suffering the loss of a spouse.